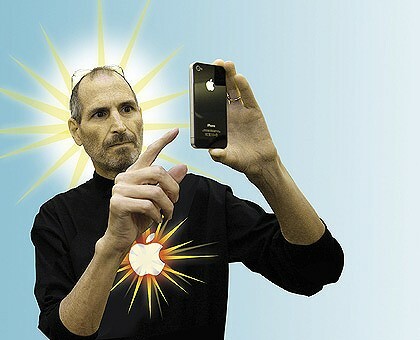 Steve Jobs is a revered figure among his own company. But is this really a healthy thing? The cult of the chief executive facilitates their money-grab, writes Aditya Chakrabortty. What happened the last time you called into work sick? A sympathetic sentence from a colleague, possibly. Some quality time alone with the television, certainly. In due course came re-entry, with the brackish waters of the office closing overhead as swiftly as if you’d never left. When Steve Jobs announced last week that he would be spending some time away from Apple, he promptly knocked $20 billion off the value of his employer. News of his sick leave made front pages and even had Wall Street analysts bemoaning the loss of a “genius”. Jobs has always been the best repackager in the technology industry. Over the past decade, he’s alchemised the plain old MP3 player into the iPod, turned the corporate road warrior’s mobile-email-browser-whatever into the iPhone and transformed the ugly tablet PC into the iPad. And last week, even as he took medical leave, the Apple boss did it again, setting the seal on the transformation of the chief executive into the figurehead of his own corporate cult. The man business hacks call iGod has been playing this game for decades. Down the years photos show him in that unchanging Boomer outfit of black mock turtlenecks and stonewashed denim – instant recognisability in an anonymous industry. Then there are his gnomic utterances and the annual religious convention, the Macworld Expo in San Francisco, where Jobs regularly turns up to lay hands on his devotees. This is free advertising for a company that needs to flog its products by the millions, of course – but the cult also numbers Apple’s own staffers. “It’s Beatlemania,” one former executive told the New Yorker in 1997 just as Jobs turned up on the company’s Cupertino campus again, after 12 years away. The saviour was back. True, before Jobs rejoined the fold, the question most commonly asked about the company he co-founded was how long it had left before making the corporate obituaries. Yet that doesn’t make its turnaround solely the work of one heavily-stubbled mastermind, who saved a company through his singular vision, taste and liberal use of the i- prefix. The messiah talk ignores the fact that Apple has around 46,600 full-time employees and another 3000 temporary staff – including some of the best designers and marketers in the business. Nor does it take into account the way in which global supply chains minimise the role of any one individual, no matter how powerful. Take, for instance, the iPad: the display panel is probably from a Korean contractor, the backlight will have been knocked up by a Taiwanese firm and the GPS is likely to have been made in Germany. Then there is the battery (Chinese, perhaps), the flash memory (which could well be from Japan’s Toshiba) and the case (Taiwan, again). Jobs is part of a widespread trend among chief executives to put themselves forward not as managers, but as leaders. Follow the coverage of the Davos summit this week and count the number of times a corporate finance officer for some accounting-software company or other is described as a business leader. Elite MBA programmes boast of how they will turn students into “change agents”. As I type, the January 2007 cover of Harvard Business Review stares back at me. “The Tests of a Leader”, it blares, under a photo of some shirt-sleeved young Turk doing push-ups on a boardroom table. “Managers do things right, leaders see the right thing is done,” said Warren Bennis, founding father of Leadership studies. The implication was clear: a manager was good at painting by numbers, but a business leader was more akin to Turner. The result has been a tremendous boost in chief-executive power, according to Dennis Tourish, an academic at Kent University in south-east England. He points out that just before Enron imploded it was run like a cult, with Jeff Skilling exercising huge control and influence over who was recruited, how they worked – and who got laid off. And while Enron was an exception, Tourish points out that Jack Welch as boss of General Electric had similar power. In the end what the leadership talk appears to add up to is an alibi for bosses taking much more money out of the companies they run. There is John Thain who, even as he ran Merrill Lynch into the wall, demanded it pay $US1.2 million to redecorate his office, including $35,000 for a “commode on legs”. Then there is Mark Hurd, who ruled Hewlett-Packard with the iron law of pay for performance – until he was himself drummed out of office last August for alleged corporate malfeasance and took a severance package of $34.6 million. And in Britain, there is BP’s Tony Hayward receiving millions for his role in turning the Gulf oil spill from a tragedy into a farce. Set against that lot, Jobs looks like an exemplar. But he is really the best example of an unhealthy trend.